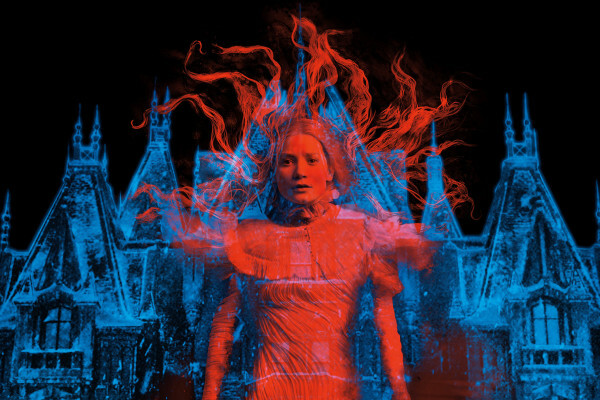 As a fan of Gothic Romance, Horror, and Ghost stories, I was super excited to see Guillermo Del Torro’s latest film, “Crimson Peak.” It is a film about an aspiring author falling in love with an obscure Baronet who lives in a remote Gothic mansion in the English hills. Following a very tragic event, Edith marries that Sir Thomas Sharpe (aka the Baronet) and moves with him to his remote mansion and begin a new life with him and his sister, Lady Lucille. While, I am not one to do spoilers, it would hardly spoil the fun of the film by saying that the move to England doesn’t end up as romantic or happily-ever-after as she would’ve hoped. It turns out that the mansion has a long, bloody, and terrible past that is literally haunting Edith at every turn. The ghosts of the past lurk in the halls, the walls and the floor boards of a house that is relentless in bringing the past to life to the horror of everyone involved. What I loved about this film is that it is a ghost tale of the classic order. It doesn’t set out to give the audience cheap thrills and “gotcha” pop-out scares. While there is a little bit of that, this film seeks to get under one’s skin and haunt them in ways more profound than anything cheap could possibly accomplish. If Edgar Allan Poe were a film writer/director, then this is the film he would have come up with. As a result, I think that this film not only haunts us with the ghosts we see on the screen, but also gives us a glimpse at the ghosts that haunt us from within as well. Each and everyone of us are haunted by ghosts of one form or the other. Each of us carries around with us things from the past that linger within us and haunt us like spooks in a boarded up abandoned house. Some of us carry around the things we’ve done in the past, similar to what I wrote about regarding skeletons in our closet. For some, there ghosts are there as a reminder of the foul play we’ve participated in. Perhaps we have hurt someone, perhaps we have harbored ill will toward people, perhaps we have harbored grudges, taken part in gossip, slandered those we don’t like, or perhaps we done things that we fear will expose us in ways that will be less than flattering. On the other hand, many of us carry around ghosts of a different kind. We have endured hurts and been weighed down by the hangups that come from them. Perhaps we’ve been bullied, been abused, been mistreated, been cheated, or been burned in one way or the other. Perhaps we have been the victim of cruelty, victims of a weakened and demoralized self-esteem, victims of hatred and bigotry, or perhaps we have been beaten down by depression and other paralyzing diseases. Whatever we’ve been scarred by, we are haunted by the ghosts that remind us of the thorny and twisted path our lives have been journeying on. What is important to note is that, whatever our ghosts are, they will not go away until we address the warnings they bear us. If your ghosts are closeted skeletons, address the ills you have done and sincerely reconcile yourself with your past and those you have brought harm to. If your ghosts are the kind that have been brought on by others and/or circumstances, then you need to address the warnings they bring you. Whatever you are demoralized from, whatever is casting a haunting, shadowy stain on your soul, these ghosts are serving to let you know that something is NOT right with how you currently view yourself. You are a beautiful person, a child of God, worthwhile, and valuable. Until you seek help and get past your ghosts, you will continue to head down the corridor of foreboding. I pray that you put your ghosts to rest and step out into the light where you belong. Lord, help me to understand that the ghosts that haunt me are angels warning me that something needs to change. Help me, also to discover what that “something” is, and empower me to change it. Amen.